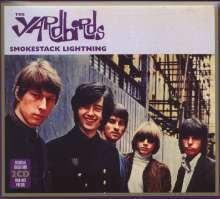 Der Artikel The Yardbirds: Smokestack Lightning (Essential Collection) wurde in den Warenkorb gelegt. The Yardbirds exploded out of the London suburbs in 1963 delivering a combination of blistering rhythm and blues and a string of mind-boggling singles which blazed a trail for psychedelic rock. An unparalleled trio of guitarists (Eric Clapton, Jeff Beck and Jimmy Page) provided the rocket fuel for this underrated band’s stunning carrer. Hörprobe Track 11: What Do You Want? Hörprobe Track 15: Baby, What's Wrong?